As this is the last newsletter for the term, I would like to take this opportunity to thank Dominica Leaver, Year 12, for her dedicated leadership of Social Justice this year. Dominica has overseen the expansion of JPIC to 118 members and has demonstrated compassion, inclusivity and a burning desire to create a more just world. I would also like to thank our Social Justice Leaders in the Houses for their commitment and dedication to our social justice endeavours throughout the year. Jacqueline Sharah, Ciel Vella, Chiara Bragato, Isabel Cant, Abbey Boshell, Rachael Curran, Elizabeth Isaac and Olivia Weaver have led their Houses to contribute compassionately and generously to Project Compassion and the Vinnies Christmas Appeal. 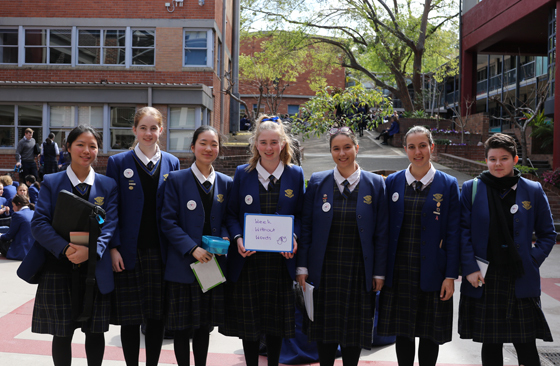 During the Year 10 Week Without Words Fundraiser and Awareness Campaign, a group of ten girls chose to be silent for the entire week in order to experience what the children of St Lucy’s experience on a day to day basis. “During my time without my voice my biggest struggle was communicating emotion. How I felt about a situation was very hard to communicate when others were talking because they had to be looking directly at me to see my expression or gestures. I found this very eye opening as I couldn’t call out to a friend or just say “hi” or “how are you”. I really enjoyed my wordless week but what I found most interesting was when I used my voice at home I often found myself hesitating to speak as I had been telling myself all day not to talk. To not speak out and not get your words interpreted correctly was hard to deal with by Wednesday. I used American sign language, Auslan, paper and pen and many gestures to try and get my point across but since those receiving my message didn’t know ASL or Auslan my words were often lost. In class I would often try and answer questions by typing them on my laptop and getting my partner to speak for me, but the message got lost since I had to type very quickly, and I often left out common words such as “and, this, when” which led to more confusion than my sign language. Luckily quite a few girls had pledged for the full week. I found it much easier to communicate with them as they understood that you needed eye contact and to pay attention to body language. Lots of the girls loved bumping into someone else who couldn’t speak so they could borrow their whiteboard or note pad to help them. On the Friday I found it very hard to keep my silence , but I kept going and this made me really look back on how much I use my voice in all sorts of situations.